Acromegaly can be cured by first-line pasireotide treatment? Pasireotide long-acting release (LAR) is a new generation long-acting somatostatin multi-receptor ligand, with an increased affinity for the five subtypes of the somatostatin receptor compared with first-generation somatostatin analogues (SSAs) . Several studies have proven the efficacy of pasireotide LAR in reaching the biochemical control of acromegaly, both in medically naive and in patients resistant to conventional SSA [2, 3, 4, 5, 6, 7]. 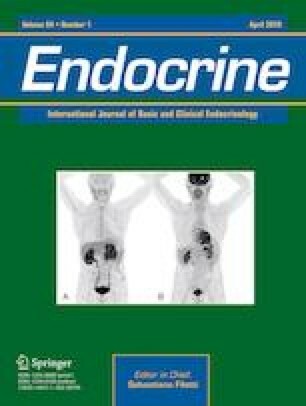 We report here the case of a patient with acromegaly who was successfully treated with first-line pasireotide LAR. Medical writing and editorial assistance were provided by Luca Giacomelli, PhD, and Aashni Shah, on behalf of Content Ed Net; this assistance was funded by Novartis Farma (Origgio, Italy). MS is Novartis Farma employee. The remaining authors declare that they have no conflict of interest.